NEW! Stronger Formula For More Effective Relief! Premier Biomedical Pain Relief Meds Hemp Oil Extracts Roll-On with 150 mg of phytocannabinoids is easily applied directly to the skin, for relief of minor aches and pains. 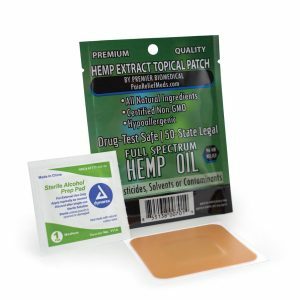 Quickly absorbed, the Premier Biomedical Pain Relief Meds Roll-On contains isolated industrial hemp based extracts in a convenient roll-on product that you can use discreetly, anywhere on your body. 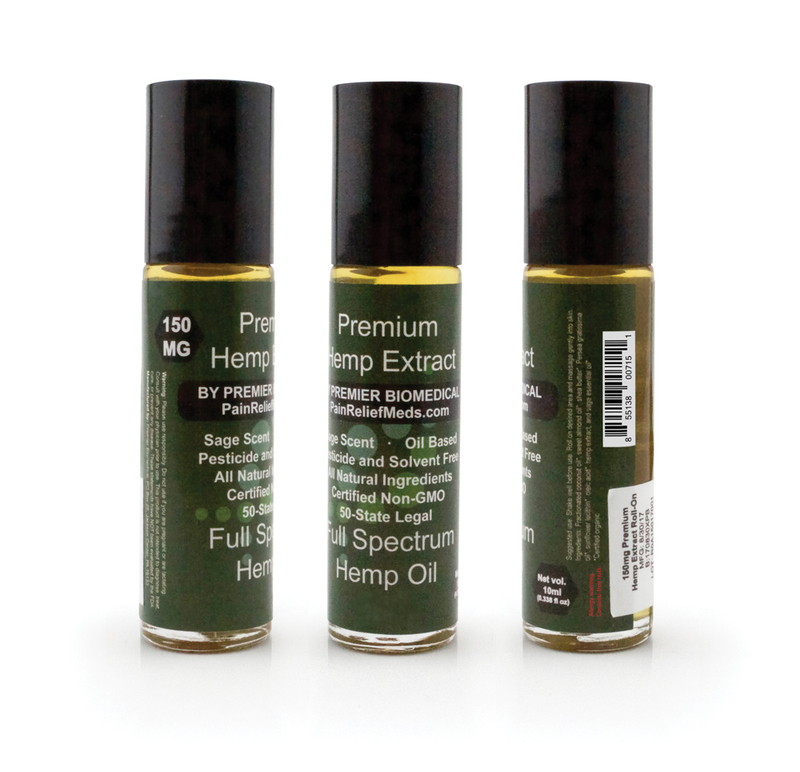 Hemp Oil — CO2 extracted decarboxylated Hemp extracts with natural terpenes and flavonoids. Fractionated coconut oil with unsaturated fats (monounsaturated and polyunsaturated fatty acids). Sunflower Lecithin (a source of phosphoric acid, choline, fatty acids, glycerol, glycolipids, triglycerides, and phospholipids). Sage essential oils (for aroma and antibacterial properties). 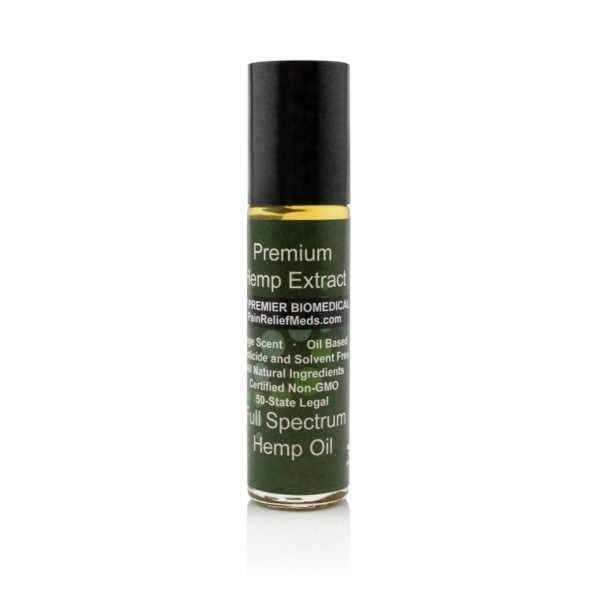 This CBD hemp oil smells great, it’s not greasy, relieves my nerve pain and lets me sleep better at night. I use it on my wife’s legs when her calves cramp up at night and I’ll roll it on my kids forehead when they have a headache. I even used it on my sons foot when he had a really bad spider bite and couldn’t believe how much relief he got and how quickly he healed. 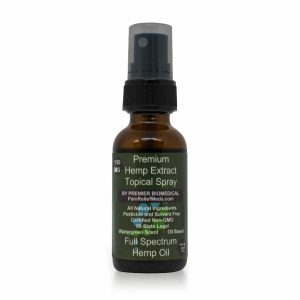 The Hemp extracts topical roll on is helping me stay off deadly addicting opioids by providing safe effective pain relief every day. No pain no opiates its that simple. This Hemp Oil roll on needs to be in every first aid kit and medicine cabinet in America. It helps sooth minor sunburn pain, headaches, back pain, sports related muscle pain, knee pain, bursitis and even calms my phantom limb pain. Opioids, Lyrica and Cymbalta could never even touch my phantom limb pain. I want to take a bath in this oil, that’s how good it works and smells. 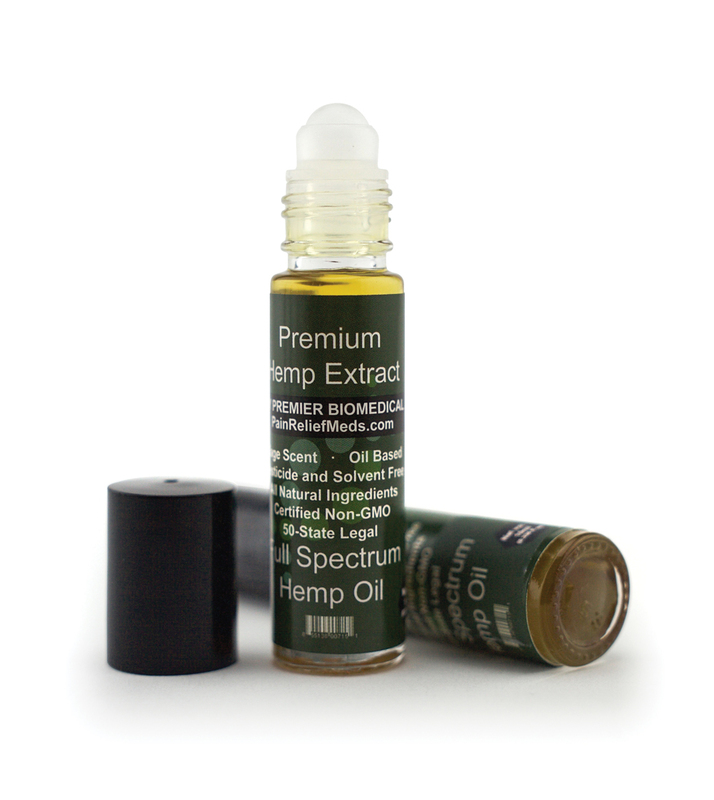 A Chronic Illness Blogger has published a review of our 110mg Hemp Oil Roll-on Applicator. See our blog page, or view the review here. 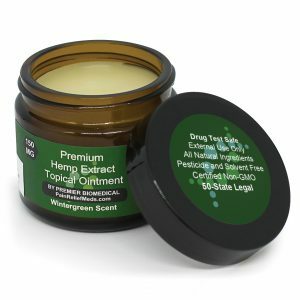 I’ve used the Hemp Oil roll-on for some leg tendon strain/pain and the oil relieved the pain within minutes and the relief lasted overnight. I had an upper toothache and applied the roll-on oil to my cheek. The pain went away within a couple of minutes and the relief lasted all day. I gave a roll-on to a co-worker, who had upper back pain, and the hemp oil relieved the pain overnight. She let her father use the oil on his arthritic fingers and the oil relieved the pain for hours and he was able to use this fingers without any associated pain. The hemp oil roll-on is great to have handy around the home. I couldn’t believe how quickly the pain was gone after applying this to my neck! I introduced it to my sister for similar pains and she immediately wanted to purchase it. Now that she has her own bottle, she has told our mother who has since purchased a bottle along with several of our friends. All of them have been very pleased about how quickly the product was shipped out but most of all, for the quick relief of pain and it’s pleasant smell. Everyone has been calling giving me good feedback on the product, so I thought I should add a review here. All those that I have introduced to this product to so far, have all been very happy customers and are telling others about this amazing product! Even though the bottle is small, I’m surprised by how many times I’ve used it but it looks like I’ve barely used any of the product at all! I am the racquets director at a private Racquets club as well as the head tennis professional and pro shop owner. I ordered the roll-on for tendinitis in my elbow and knee and had such great results that I am stocking the shop for members to buy. After letting the members try my roll on I have sold many of them and the feedback has been very good. If you’ve tried everything and are getting no relief this is the product for you. Smells good also! I have been dealing with tennis elbow for 9 months with little relief. The VA and doctors couldn’t really help me all that much, ibuprofen 3 times a day still no relief. I enjoy working out and weight training and have been at a standstill since injuring myself. I applied the roll on to my elbow last night and went to bed. When I got up in the morning the pain in my elbow was just about gone! I applied some more in the morning before work and I haven’t had any pain in my arm ALL DAY! INCREDIBLE! Love this product! My buddy gave me the roll-on to use on my arm and elbow that had a severe strain. Normally it takes me several weeks to heal something like this. I coated the area one time and went about my day. Within 8-12 hours, the pain had subsided greatly and within 24 hours, it was gone completely. Needless to say, I avoided a lot of pain by using this stuff. When they tell you this is an amazing product, you can believe them. And if you are a total cynic and think these reviews aren’t real., try the product and then fill out a review form yourself. You’ll see this is absolutely genuine. I purchased the topical roll-on about a week ago so I’ve had ample time to get the full scope of benefits this product provides. Being new to hemp oil I was initially skeptical about what it would actually provide me in terms of relief. After a week its safe to say I will continue to use this product and look forward to using the patch. Prior to me purchasing the roll on I contacted a distributor and wanted their opinion in regards to the benefits they’ve seen and the customers opinions who have used the product. In both aspects of my question I was excited after I heard their responses of people seeing relief on multiple levels with multiple issues from minor to moderator. As a result of their take I ordered the product and upon arrival immediately applied it to my problem areas. What bothered me the most is having a sharp pain in my both my shoulders and a mid but consistent pain in my right knee. Within 30 minutes of applying the oil (which smells pleasant) I felt about 40% relief and after an hour I couldn’t feel the pain I use to feel almost on a daily basis in all three areas. I have been applying the oil everyday since for about a week and continue to experience the same results, I’m definitely a believer of hemp oil and in particular the product that this company manufactures, next up is the patch and once I get a good run of it I’ll most definitely be posting the outcome! In addition to the relief I experienced I had my father who has a herniated disc in his lower back and a pinched nerve try out the oil as well in his problem areas and the pain from the pinch nerve was gone within an hour and his lower back pain around 50-60% gone, I think his lower back pain is more extreme than this is meant to handle which is why I ordered a patch for him. and look forward to posting the results. Purchased this amazing product last week for chronic neck , back, and hip. This roll-on is great, it’s convenient , smells good, and works fantastic. My liver finally gets a break from ibuprofen and aspirin. I bought this product for my friend who has been having knee pain for quite some time. After applying it he commented that the smell was great and that he actually could start to feel the pain fading away almost immediately! I plan on getting this for my parents who are struggling with joint pain as well!